Had a job interview today with a certain world championship organization (more on that in weeks to come), but now it is off to Belize for a long overdue adventure. It was so sad to drop off poor Homer at the crazy dog lady's house, just like leaving a kid at his first summer camp. If you need me, you can find me here - www.cavesbranch.com. 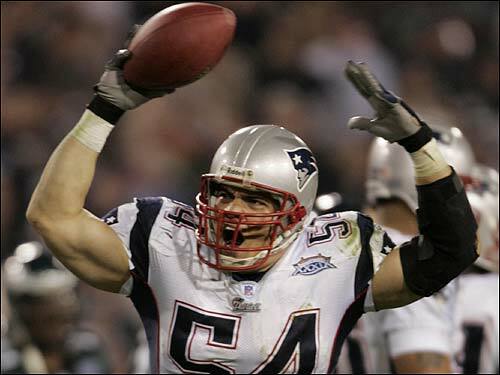 Woke up to the horrible news that Tedy Bruschi was rushed to the hospital yesterday. Rumors have been running all over Boston that he suffered a stroke and had symptoms of sever headaches, blurry vision and paralysis. Reports later today said he suffered a burst blood vessel in his head. He is being kept for additional tests and hopefully this will end up being something very minor. UPDATE: It has been confirmed Tedy suffered a mild stroke and should be released on Friday. What this means for his football career - nobody is saying. The Pats are gonna give me a heart attack with all these Super Bowl wins by three points. The Eagles made it a Hell of a game -- but they just weren't gonna win. Think I'll book my room in Detroit for a year from today in the morning. In trying to keep my head from exploding waiting for Super Bowl XXXIX I've been hitting the big Oscar nominated films lately. First up was "The Aviator" - which I thought was great. Not knowing much about the life and times of Howard Hughes - I was sucked in from the opening moments and completely enthralled for the entire film. I thought Leonardo DiCaprio was fantastic and this could finally be the year Scorsese gets his Best Picture Oscar. Next up was "Sideways" featuring one of my favorite actors, Paul Giamatti, who should already have a best actor nomination for last year's "American Splendor". The flick has some hilarious scenes and is sort of the "Dude Where's My Car" for 40 year-olds. But today we saw "Million Dollar Baby" - and I was completely and utterly blown away. I thought Clint Eastwood's last movie "Mystic River" was a gut wrencher, but this one makes that look like "Meet The Fockers." It is amazing that at 74, Clint has made the best film of his career. If "Baby" doesn't win Oscars for Best Picture, Best Director, Best Actor, Best Actress and Best Supporting Actor it will have been majorly shafted. While most Hollywood films stay with me for about as long as it takes to reach my car, the emotional impact of "Million Dollar Baby" sticks and haunts. You have to see this flick. There will be no more double-secret probation because the fantastic character actor John Vernon has died. He had performed in over 200 film and TV productions -- none bigger than "Animal House". After long and profound deliberation, I've decided my brain can't handle going to another Super Bowl so soon after seeing the Pats win twice already and the Sox winning the World Series. So Bill and the Boyz will have to win one without me this time. Going to last year's Super Bowl in Houston made us cancel plans for a trip to the Amazon. One day in Houston cost more than a week in Peru. So this year we are going to Belize at the end of February. And I bet I'll be wearing some new SB XXXIX Championship gear too.